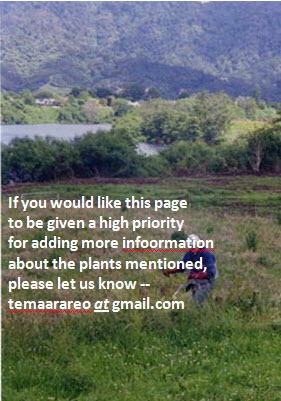 Proto Eastern Polynesian: *Maire hau, Fragrant plants reminiscent of the Alyxia vines . Note: See the other linked page (highlighted at the top of this page) for more information about the ancestral names, their modern descendents, and the plants they denote. The mairehau is a many-branched shrub associated with kauri (Agathis australis) forests in the Northland, Auckland, Waikato and Coromandel regions. The narrow leaves, about 3-5cm long, are dotted with oil glands, making the whole plant aromatic even when the fragrant flowers are not in season. It is clearly for this reason that the early Polynesian settlers of New Zealand bestowed on this species the names mairehau and māireire. The botanical name Leionema nudum is of very recent vintage; books published before 2015 will refer to the mairehau as Phebalium nudum. 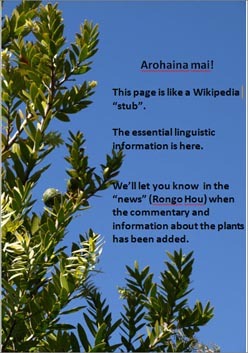 References and further reading: There is a good article on the mairehau in Muriel Fisher's Gardening with New Zealand's Shrubs and Trees, and the NZ Plant Conservation Network site has the essential botanical description and good photographs.